When my partner Patrick Epino told me he was going to be in a movie, I was excited. He's a writer/director/actor, but this role was personal. It's a film about people just like us. "The film is called Bitter Melon," he tells me. "It's a tragicomedy." 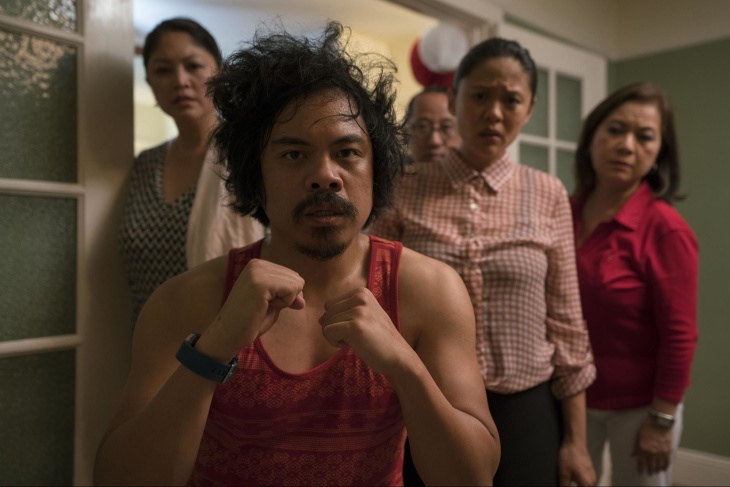 That's true — the movie, funded in part on Kickstarter, is both a tragic and comedic tale about a Filipino-American family that plots to kill a member who's been terrorizing them for years. Patrick plays a menacing family member named Troy. Bitter Melon screens at Outfest in Los Angeles on Friday. But before it started screening at film festivals, I asked Patrick if he felt any pressure playing such a challenging role. "Not pressure. I am a little anxious, to be honest," he said. "We'll see if I need to take several bathroom breaks during the screening." At a sneak preview in Hollywood, Patrick calmed his nerves and took a bathroom break, while I caught up with H.P. 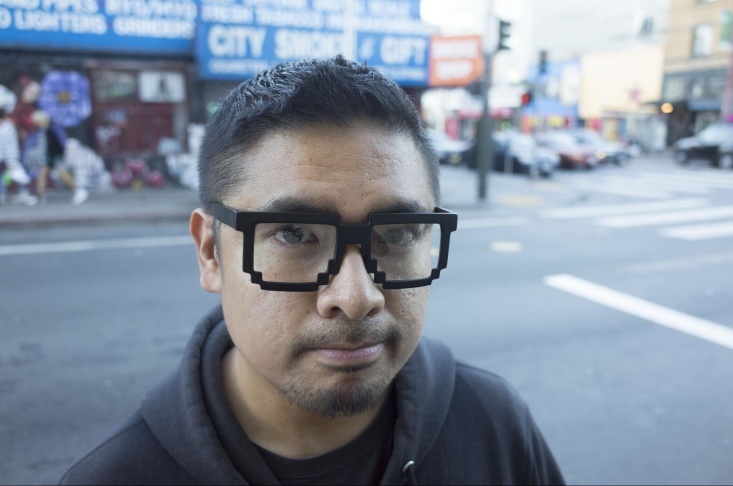 Mendoza, the film's San Francisco-based writer and director. H.P. 's previous work includes the horror film I Am a Ghost and Colma: The Musical, a coming-of-age high school musical set in a small Bay Area town. H.P. wrote the script and composed the music. New York Times film critic Manohla Dargis called it "an itty-bitty movie with a great big heart." Bitter Melon is H.P. 's most personal project. The title refers to ampalaya, a Philippine tropical vegetable with a bitter flavor. It's a fitting name for a movie where characters act in ways that can be hard to swallow. "I do feel like it's a dark comedy, because we are asking you to laugh at this really grotesque thing that happens, right? But we do honor the drama of it, so it is actually kind of sad," H.P. said. Bitter Melon kicks off when Declan Santos (Jon Norman Schneider) heads home to spend the holidays with his family in San Francisco. Like a classic Filipino family party, he's surrounded by plenty of food and relatives, including his loving mother Prisa (Josephine de Jesus), funny oldest brother Moe (Brian Rivera), fun cousin Tiva (L.A. Renigen), and sweet sister-in-law Shelly (Theresa Navarro). But the man of the house is Troy Santos, the jobless brother who still lives at home. The family walks on eggshells around him because he's dangerous. He physically abuses his wife, and scares his daughter. Things get so bad that Declan comes up with a plan to end his brother's reign of terror for good — why don't they kill Troy? 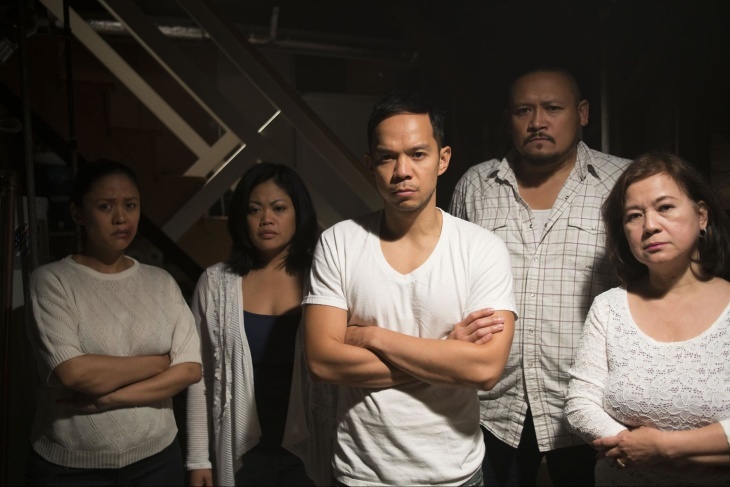 The premise sets off a surprising sequence of events, forcing characters to grapple with the dark side of their traditional Filipino family. H.P. assures that no real people were harmed in the making of this movie. But it's based on his real-life experiences, and the characters are modeled after his real family. Declan, a gay Filipino American navigating his religious, traditional family, is based on H.P. Prisa, played by Josephine de Jesus, is modeled after H.P. 's real mother, who just recently gave her blessing to talk about the issues the film brings up — like the physical abuse she endured with H.P. 's estranged father. Patrick's character Troy embodies a lot of their deep-rooted problems. "I like the fact that H.P. makes his own kinds of films, and I think he touches on things that a lot of Filipino families, a lot of Filipino American families too, don't talk about," Patrick said. Like many Asian immigrant communities, Filipino-American families tend to sweep things under the rug in order to keep up appearances. They're less likely to talk about issues like domestic violence and abuse. When the characters in Bitter Melon do the opposite, it's cathartic. Thrilling. Sometimes confusing. H.P. says it's because we're not used to seeing Asian-Americans, let alone Filipino-Americans, in mainstream movies. Growing up, his family would get excited anytime they would see a Filipino character in a Hollywood movie — even if the character was played by a non-Filipino actor, like Anthony Quinn in family favorite Back to Bataan, a World War II drama set in the Philippines. "They were just happy that there was a Filipino presence in that movie," Patrick said. When you're used to seeing little to no Filipino-American characters or stories on-screen, and then all of a sudden you are confronted with a movie like Bitter Melon which features an array of Filipino characters, the experience is way different. H.P. says this is especially true when the leads are Filipino characters who challenge the Asian-American stereotype of the overachieving "model minority." In Bitter Melon, Declan and his family aren't wealthy, and they often make bad (aka human) life choices. There's also the abusive family member Troy — and the part where the rest of the family tries to kill him. H.P. says he faced challenges making a film with Asian-American actors who didn't portray stereotypes. At test screenings, one person said the cast all looked the same, so he couldn't tell them apart. H.P. says another person commented, "I know you're saying this is a Filipino-American story, but there's nothing specifically Filipino-American about it. Have you considered shooting this movie with 'regular' people?" It's similar to what happened at the premiere of the groundbreaking Better Luck Tomorrow at Sundance in 2002. During the Q&A, an audience member asked if it was irresponsible to portray Asian-Americans negatively. "What I find very offensive and condescending about your statement is nobody would say to a bunch of white filmmakers, 'How could you do this to your people?' This film has the right to be about these people, and Asian-American characters have the right to be whoever the hell they want to be. They do not have to 'represent' their people." But In 2018, Asian-Americans are still subject to stereotypes. Now Bitter Melon is subverting them. Christopher Aguilar attended the L.A. preview screening and says that Bitter Melon is a game-changer. "Being a Filipino American myself, it was just a breath of fresh air to see my family on screen," Aguilar said. "And to see a character that is Filipino-American-specific that I can relate to, it's about damn time." Sure, I'm a little biased, but I've watched Patrick work on this since he first got the script over a year ago. When I check in with H.P. the day after the screening, he says the most important feedback he's received has been from the Filipino-American community. "I know I want everyone to be moved, but there's something special knowing that Filipino Americans are like, 'No, but there's a little something here. Like, you actually get this,'" H.P. said. "I like being told by, quote-unquote, 'my people,' that I get it." A week after the preview screening, Bitter Melon premiered to sold-out crowds in Oakland and San Francisco, where it premiered at CAAMFest. It's making stops in L.A. and New York this summer. With some luck, it'll be in a theater near you soon.